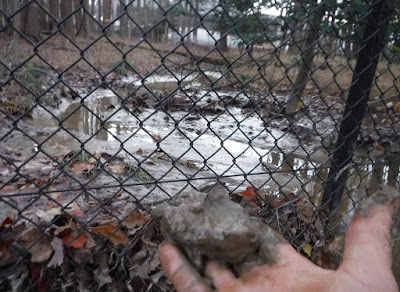 While Fairfax County officials insist controls put into place at the construction site for the Inova Center for Personalized Health on Gallows road are keeping sediment out of a Holmes Run tributary, environmental activists say the problem has not been adequately fixed. After Kris Unger of Friends ofAccotink Creek (FACC) reported the problem in October, several sediment control measures were installed, and the county’s Site Development and Inspection Division (SDID) said sediment is no longer leaving the construction area. “At the time of my inspection there was no physical evidence of any sediment deposits outside the limits of disturbance and therefore a violation was not issued,” states a Nov. 14 email from H. Keith Anthony, engineering inspector technical specialist with SDID, to Dean Naujoks of Potomac Riverkeeper. “I did not observe any sediment deposits outside the limits of disturbance, therefore I do not believe any sediment reached Holmes Run or any stream,” Anthony wrote. Unger returned to the site in Nov. 16, after the report from SDID, and documented – with photos and video – stormwater flowing from the construction area into a channel and depositing sediment into the stream beyond the limit of the sediment control measures. Unger has suggested a site visit to reconcile the different interpretations of what’s going on at the site, but hasn’t heard back from the county. Obviously, the County just can't be bothered. Mr. Unger, thank you for following up. The contractor has an obligation to make sure proper controls are in place. This is the beginning of the failure here. The County staff are likely overworked with all the rainfall this year but there is an oversight role. I'd like to see fines imposed on the contractors who do not do what is necessary to protect water quality. When it starts to cost them real money they will comply with the regulations. Otherwise taxpayers get left paying for all the water quality problems while these bad players walk away laughing at us because they own the process. We can do better than this. Very well put! It shouldn't take a lawsuit down the road to set things straight, when they were wrong to begin with. I've put it off for too long; I'm joining Friends of Accotink Creek. And where is INOVA in all of this? This is their site, their contractor, their mess. Why aren't they instructing their contractor to clean up their act? These are people who are supposed to care about good health, now we see how much they care about clean water. And they want to develop this whole site? Now we see how much they care. Why aren't they being more responsive and proactive on this? What an awful tone they are setting. INOVA probably figures if they make everyone sick downstream they will have to end up at their facilities to manage their environmental illnesses. Quite a good business model! This is an absolute joke. Who is H. Keith Anthony, and how incompetent can one be? Is he just ignorant, or benefiting somehow from Clark Construction or INOVA to just brush things aside because "there's been a lot of rain lately", and "we will be finishing this up real soon, so let's not get carried away", etc, etc. Clearly this whole thing does not pass even a cursory smell test. I doubt this project is in Penny's district, because overall it's a great development - she is more into car title loan places from what I've seen - but someone needs to manage the means to an end. The contractor needs to manage their discharges, no matter how rainy it has been and how much they have donated to whoever's campaign.